Motorcycle jackets are cool. Even the most diehard conservative secretly would like to wear one. Just for the cool factor. Being part of the ‘in’ or ‘cool’ crowd is a goal of many young teens and wearing a motorcycle is their ticket to popularity and positive attention. 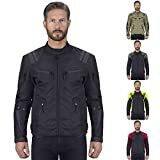 To help you guide your cool teenager to the right motorcycle jacket that will boost their popularity here is a list of the top ones for 2019. Technology has reached the motorcycle jacket fashion style and upgraded the look. You no longer need to look like a thug hunting for a gang fight with this new design. Stylish, cool and waterproof help make this jacket very popular. This jacket will keep anyone warm on those cold nights in the Spring or Fall. An adjustable strap helps the jacket to fit comfortably around the waist region. It comes with shoulder protection, just in case. This great looking jacket comes with fabric that allows your body to breathe and keep its cool. It is also double and triple stitched in the shoulders and elbows to add more strength to the jacket. The jacket also has elbow and shoulder armor just in case the wearer takes a spill on their cycle. The one downside is that it is not waterproof. Make sure you check the weather forecast before venturing out wearing this great looking jacket. Unfortunately, a photo is not available or we could show you the detachable hood that is a prime accessory for this jacket. The fabric is non-leather for those animal-friendly people who do not like any product made from any part of an animal. 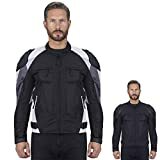 The jacket can be made in America, a plus, or it can be imported but one word of warning, the sizes run a bit smaller than standard American sizes so be careful when you order yours. The modern motorcycle jackets bear little resemblance to the motorcycle jackets of old. This stylish number with red accents is waterproof and a removable thermal lining that can keep you warm in the winter or be taken out for the summer heat. Zipper vents complete the updated look. Red is not the only color you can have in your accents. You can choose between red, blue, white or green. Having a choice is good. For any safety-minded motorcycle enthusiast protection of the body is important. This jacket not only has the usual shoulder and elbow protection but also contains armor for your spine. This sets this jacket above the rest as your safety is Viking Cycle’s concern. An added feature is the many pockets that are placed on this jacket. You even have room to carry your toothbrush. One con may be that the shoulders and elbows may not be flexible enough for one hundred percent comfort. Made from 600Denier Polyester fabric this abrasion resistant jacket comes with double stitching using nylon thread. It is meant to stay together even in the toughest of situations. Your body will not overheat in this jacket as the chest is made of strong polyester mesh which allows for greater air flow throughout the interior of the jacket. This is a wonderful idea for a Christmas or birthday gift for your fashion conscious child. This traditional style motorcycle jacket is made from tough cowhide and has all the details a traditional motorcycle jacket used to have. It even has the waist belt to make sure the jacket fits in all the right places. Your motorcycle jacket supporter will feel tough and very ‘cool’ when they put this great number on. The thick leather will protect them as well. You cannot go wrong when you choose this jacket to complete your fashion statement. Designed with no center seam this jacket brings toughness back to the modern motorcycle jacket trend. It is so strong that it is abrasion resistant and the back pad is removable so you can upgrade to a pad more to your liking. The fluorescent green color provides the wearer with the utmost visibility even in heavy traffic. If you like anonymity the jacket comes with some more subdued colors. Along with the color choice, it comes with the now standard double and triple stitching. You can wear your motorcycle jacket all year round with this classic design which includes zip out lining. There is no need to buy more than one jacket as this traditional style will give you the perfect fashion statement. Made from top grain leather this classic has three outside zippered pockets to safely carry your important items. Top quality craftsmanship gives this jacket its durability and your confidence that it will be around a long time. When you or your child put this updated motorcycle jacket on they will look like they just stepped off a movie set. This updated version of the traditional motorcycle jacket is setting the bar for all others to follow. Its zipper pockets fleeced lined sleeves, extended collar tells others that the wearer means business. The wearer will also look like a star with this futuristic design to a classic. 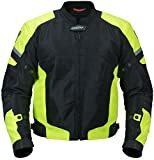 Purchasing a motorcycle jacket has never been tougher with all these new designs and upgrades. The best thing we can say is to find the one that appeals to you and buys the one that fits your style and personality. They all make great gifts for your loved ones. The added protection will keep you and your loved ones safe.